Metal horse number 1 was born on a big ranch. He did not much handling for his first 2 years of life. He was brought in from pasture every 2 months to have his hooves trimmed. He was never really taught to lead but he figured out if he yielded to the rope he stayed out of trouble. He also watched the older horses being led and this helped him understand. In the spring of his 2 year old year, Metal horse number 1 was brought up with a bunch of other colts his age and started under saddle. At first the saddle was scary but no harm came to him from it so he was OK after the first few times. It was really nice to see that the other colts were OK as well. Having a person on his back was not a big deal once he figured out how to keep his balance. After the first few rides he could carry a person easily at a walk, trot and lope. After a month of learning the basics of moving, steering and stopping Metal Horse number 1 was turned back into the pasture for a year to finish growing up. In the spring of his 3 year old year he went back into work moving cows and checking fence. Eventually he learned to have ropes around him and how to hold a calf down at the end of a rope. He was actually pretty good at this so he started going to roping events each weekend. Roping at rodeos was very different from roping at the ranch. There were crowds of people, fireworks, carnival rides and other distractions. Once at the arena, however, Metal horse number 1 knew exactly what was expected of him. All the practice sessions and on the job training had created confidence in how to do his job well and he took pride in this. He worked just as he had been taught and his rider also performed with skill. They were a great team. Metal horse number 1 went on to have a very successful rodeo career. He held his weight well on plenty of grass hay, whole oats and rice bran. In the winter, when there was no grass, he got a small flake of alfalfa. When on the road he received the Metal horse balancing formula which helped support his connective tissues, immune system and digestion. He enjoyed his job and his life. Metal horse number 2 was born on a warmblood breeding farm. From day one he got plenty of attention as he and his dam were brought in and out from turnout every day. Much of his time was spent in a stall and he really missed playing with his friends in the pasture. As he grew bigger he noticed the people who cleaned his stall and held him for hoof trimming were not consistent around him. Sometimes they moved him as they needed and other times he was able to make them move away from him. This was very confusing. Who was really in charge? Once Metal horse number 2 was weaned, he lived in a stall and went on a walker daily. He never got to see his buddies or play. He had plenty of good feed, grass and alfalfa hay. He felt fantastic and really wanted to run. Sometimes when he was being led to the walker he could not help himself and he broke free and went bucking and running around the property. The handlers put a chain over his nose so he was not able pull away but he would still rear and buck when being led. He didn’t want to hurt anyone but he was so full of energy. 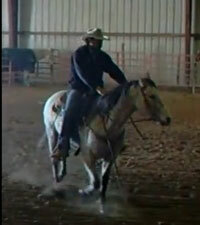 When it came time to be started under saddle Metal horse number 2 was ready to get to work. He saw other horses being ridden and was looking forward to something other than the stall and walker. He wanted a job. The early saddle training took forever with lunging, with and without a saddle, and side reins to keep his head in position. Finally the trainer got on him but it felt much different from what he had expected. They just walked around with the trainer pulling him different directions and kicking on him. Every time he got going the trainer would kick him and pull him in another direction. It made no sense at all. Eventually Metal horse number 2 learned to respond to all the pulling and kicking. He learned to trot, canter and go over jumps. His trainer seemed happy and he stayed out of trouble. He started going to shows and usually got a ribbon in his jumping and flat classes. He did not mind going to shows but the constant exposure to dust irritated his lungs so he developed an annoying cough. He also had several impaction colics because he did not drink enough water to compensate for the extra work. Metal horse number 2’s trainer added rice bran to his diet and cut out the alfalfa hay. His grass hay was rinsed to cut back on dust. BreatheWise was sprayed in his nose once a day when he worked in dust. He started feeling better. He started to get the Metal balancing formula when he went to shows. He noticed he was more relaxed and thirsty. Without the chronic cough and discomfort from impactions his performance improved and he began to enjoy his job more. His trainer worked hard to perform well and they started winning rather than placing. They were a good team.